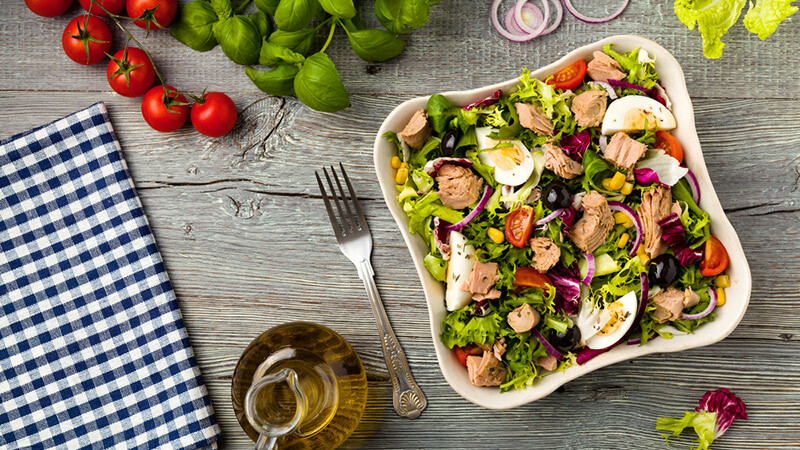 If you’re trying to eat healthier or lose a few pounds, lunch can prove to be a stumbling block, with limited time and workplace temptations. The good news is, there are simple, easy tricks you can use to make sure you stay on track. 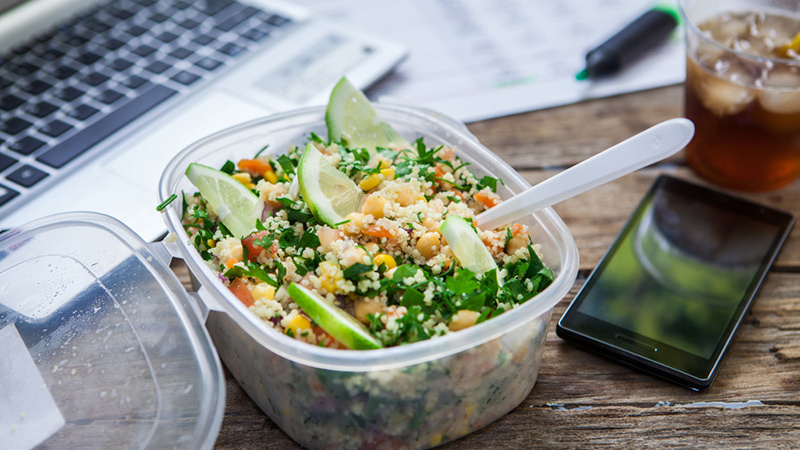 Here are a few lunchtime tips to make your midday meal that much healthier. Not only should you start your day off with a big glass of water, but you want to be sipping on H20 at your desk throughout the day, too. Skip the sugary juice and sodas and always eat your lunch with a tall glass of water. We often confuse dehydration with hunger, so staying hydrated is key to controlling your appetite. 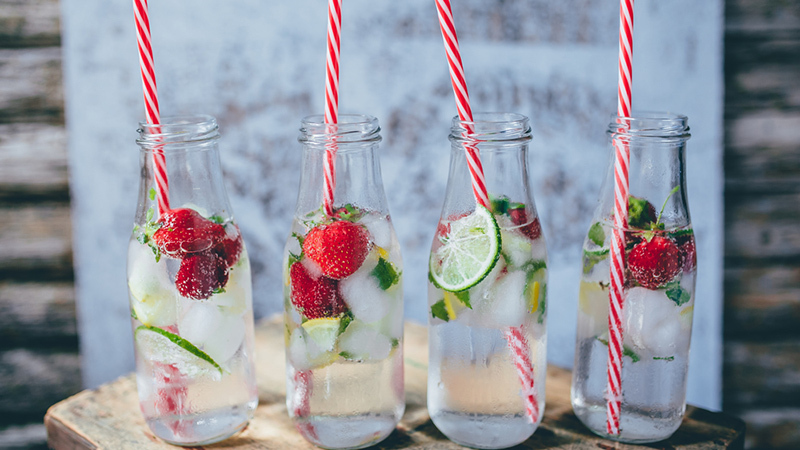 If you’re bored of the plain stuff, try jazzing up your water with one of our detox water recipes. You know the drill. There’s no getting around it. 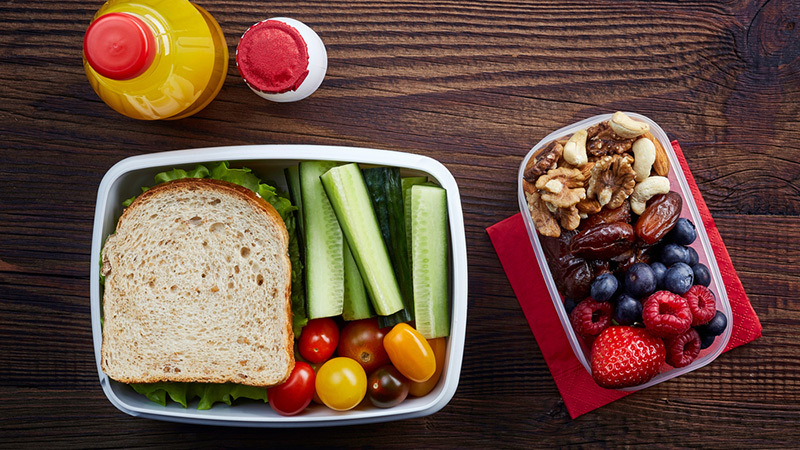 The only way to make sure you’re having the healthiest lunch possible is to pack it yourself. Though a fast-food sandwich or a take-out cafeteria meal is certainly more convenient, these pre-made foods tend to be full of extra sugar, chemicals and unbalanced macros that do nothing to help your waistline. Take the time to pack leftovers into a tupperware for the next day, or prepare your lunch the night before so you aren’t scrambling for time in the morning. Make sure you pack some healthy snacks, too, so you aren’t heading to the vending machine during the 3 pm slump. 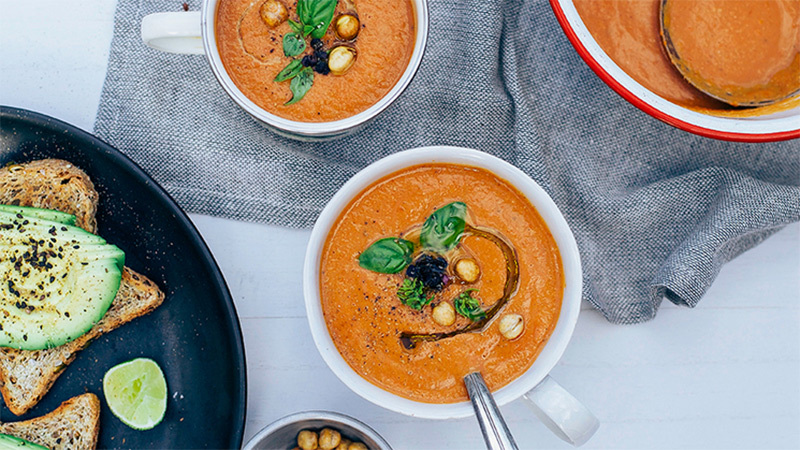 Starting your meal with a delicious salad or soup can contribute to a feeling of fullness, as both these foods contain plenty of water and fibre. Plus, they’re typically loaded with vegetables and nutrients, which is always a great way to start a meal. If you’re bringing a salad from home, you can simply use a bag of mixed greens and add a few baby carrots or cherry tomatoes, then drizzle a bit of your favorite vinaigrette on top. Like vegetables, eating fibre-filled fruit fills your stomach and leave less room for tempting, but calorie-dense treats. Always add a piece of fruit at the end of your meal; it can help curb sugar cravings and act as a tasty, after-lunch treat. Like fibre, protein helps us feel full longer, moreso than if you’re only eating a carb-heavy meal at lunch. 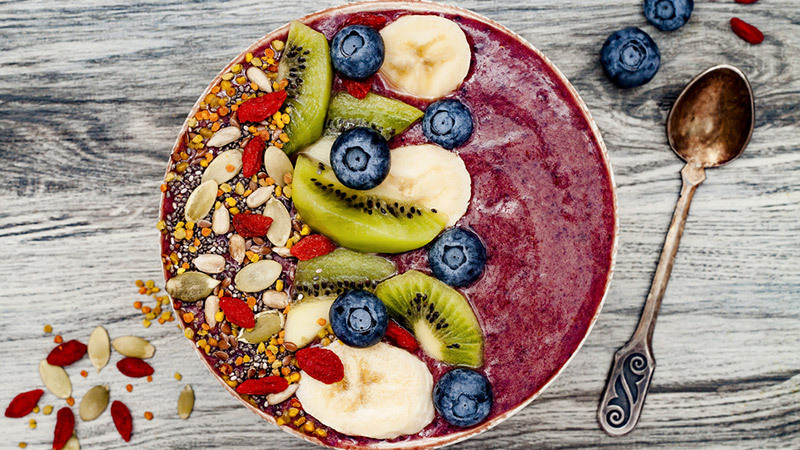 And if you’re getting a workout in at some point during the day, you’ll definitely want to load up on protein to help your muscles regenerate. Lean meat, tuna, tofu, eggs, nuts, milk and quinoa are all good sources of protein. Switch it up and be sure to include protein in every lunch. One of the best ways to ensure you eat a healthier lunch is to eat breakfast. If we’re starving by the time lunch rolls around, we end up doubling down on carbs, sugars and fats. Eating a good breakfast jump-starts your metabolism for the day, and will give you more self-control when your lunch break starts. Don’t have time to make breakfast? Take it to go, or whip up a delicious breakfast smoothie. In today’s world, multitasking seems to be the order of the day. It’s only natural that people want to get stuff done while they eat, whether they’re trying to squeeze in a few work e-mails or finish that last report. However, eating while you’re distracted can lead to you eating significantly more, because you aren’t paying attention to your body’s signals. Simply being mindful of the food you’re eating and focusing on the experience of eating can help you eat less, and enjoy it more. This might be your favourite tip of all: Take a full, un-distracted lunch break. You may even be more productive because of it. If you pack a lunch for yourself, then this one should be easy. You want to pack a decent-sized lunch that doesn’t leave you starving, otherwise you’ll be hitting the vending machine by the end of the day. By the same token, if you pack too much, it’s easy to just clean your plate out of habit. Try to hit the happy medium.